"In 1974 local [from Santa Barbara] ophthalmologist Dr. Harry S Brown, M.D., created SEE International with a few colleagues and donated surgical supplies from Alcon because he believed that with the right support, a small group of skilled eye surgeons could transform the lives of thousands. He was right. SEE has grown into a global humanitarian organization with a network of over 600 affiliated ophthalmologists who have restored sight to over 370,000 worldwide. In 2009, SEE International will hold clinics in over 35 countries, increasing the number of lives transformed by sight-restoring surgery by about 10,000. 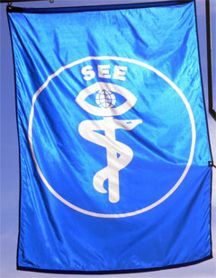 The SEE International flag depicts a blue background with the organization's logo and the word SEE. SEE International's unique logo is based on the design of the rod of Aesculapius, the god of medicine and healing. Situated atop the staff is the symbol of an eye with the ideogram of the planet Earth inside it, reflecting SEE International's mission to provide sight restoring surgeries worldwide." The image attached to the article shows the flag for vertical hosting.